“We live in a listed building that dates back to 1480 so when we were told that the chimney stack needed rebuilding you need someone who not only can lay a brick but more importantly understand buildings. We were given Steve and Andy’s name via a recommendation . From the very first contact and throughout the whole process the level of support and clear guidance was wonderful that alleviated our anxieties and gave us confidence that even before they arrived and started the job we did not think about getting a second opinion or estimate. The quality of the work and attention to detail resulted in a new chimney stack that all who have seen it comment on overall quality and impression of the stack. “We have worked with Andy and Steve on many projects, both inside and outside our 17th century thatched farmhouse. Whether it’s advising on structural or aesthetic issues, we always know that we can trust their stuggestions, because they are always formed by balancing what is right for the building with what works for the family whose home it is. 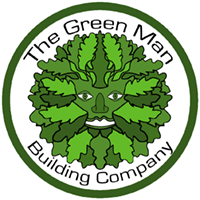 The Green Man Building Company is always our first contact when we are planning our next project, as they respect and understand old buildings, and have helped us do the right thing for ours every time, using traditional methods and materials to enable the house to breathe, delivered with a consistently high quality service and finish. We really cannot recommend Andy and Steve enough. Steve, Andy and Laura are the most enthusiastic, hard-working and professional people we have worked with so far on our renovation of a Victorian terrace house in Cambridge. Apart from fitting us into their fully-booked schedule and driving several hours to be here, they also showed us everything we need to know to finish the job, as well as getting most of it done themselves on the day anyway. The finish is far better than we had hoped for, and the whole team was a pleasure to work alongside. Organising it was easy and stress-free, and we would thoroughly recommend Green Man Building to anyone who needs work doing to a very high standard by a friendly and knowledgeable team. Client tuition session, lime mortars and re pointing.